The Accessories market consists of two segments: Watches & Jewelry and Luggage & Bags which will be discussed in this report. The worldwide revenue of US$343 billion in 2018 is expected to increase to US$369 billion by 2023. The Accessories market is, like the Apparel market, rapidly evolving. It comprises wearable, fashionable accessories that complement a person's outfit such as watches, jewelry, suitcases, bags, wallets and handbags for private end consumers. The market is divided into two segments: Watches & Jewelry and Luggage & Bags. 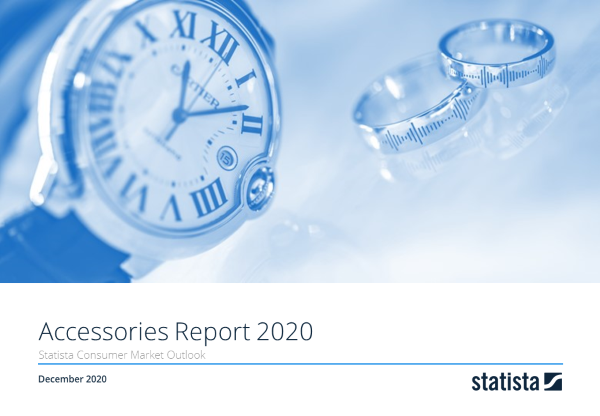 This report from the series of Consumer Market Outlook reports gives an overview of the Accessories market from an international perspective. You can find further information on the topic on Consumer Market Outlook/Accessories.